Baa Atoll in the Maldives has long been the lure of jet setters and discerning travellers. Famed for its tropical climate, vibrant colourful fish and rainbow of coral blooming beneath the pristine waters, Baa Atoll is a paradise for snorkellers and divers. It is no wonder that Baa Atoll was declared as a UNESCO World Biosphere Reserve. Baa Atoll boasts some of the Maldives’ most opulent destination beach residences, villas and resorts, making it the perfect choice for those who like to travel in style. The private luxury sanctuaries of the Maldives are nestled amongst stately palms or on beaches of pure white sand. With five-star services such as personal butlers, indulgent spa treatments and fabulous fine dining, it is easy to relax and get away from it all. The reefs of Baa Atoll, often visited by manta rays and sharks, are unrivalled for their underwater life. Hanifaru Bay is especially famed for its large population of manta rays. The tranquil atmosphere, warm crystal-clear water, rich coral gardens and colourful reef fish make Baa Atoll one of the world’s best diving sites. Windsurfing, fishing, sailing and canoeing are available too - as well as on-shore activities such as tennis and photography classes - these are just some of the things to do in the Maldives. Pinch me, I’m dreaming! Surely this is heaven on earth? Flying over coral islands strung like pearls on a necklace, and sandbanks that sparkle in the sunlight, I knew we were in for a treat long before we arrived. By the time we stepped onto the jetty to a phalanx of staff welcoming us to our ‘island home’, I was head over heels in love. 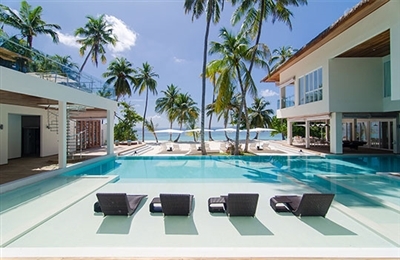 The Amilla Beach Villa Residences really are very special. This is an ultra-luxe destination with a relaxing island vibe and a generous heart-and-soul spirit. We kicked off our shoes immediately and kicked into the island groove (even the seaplane pilot was barefoot): swaying in the hammock, slipping into the silken lagoon waters, spying on the resident Maakana (heron) as he strutted along the pure-white sand. Indoors, we indulged in the many treats that arrived as if by magic throughout the day. (Turns out the villa came with its own magician – Munaadh, our hugely engaging Katheeb (house manager) who enriched our stay immeasurably.) He proved to be a mind reader, able to anticipate our every whim, and shared his unbridled passion for the island with us. He also organised a fabulous seafood-and-champagne barbecue at home – one of many culinary highlights of our stay. Sauntering along sandy paths through coconut groves, past ancient Banyan trees, we were amazed by the sheer amount of activities available across the small island. Sure, you can have the laziest, most relaxing vacation ever – I would gladly have spent my entire time at the sublime Javva Spa alone! But the chance go dolphin watching and swimming with mantas was too tempting. A shout out to the astonishing array of restaurants can’t be overlooked – the amazing culinary experiences and mouthwatering menus were among the many highlights of our trip. Sunset cocktails followed by a fresh-from-the-sea meal at the over-water Feeling Koi restaurant is an absolute must; I admit to piling on the pounds during my stay. 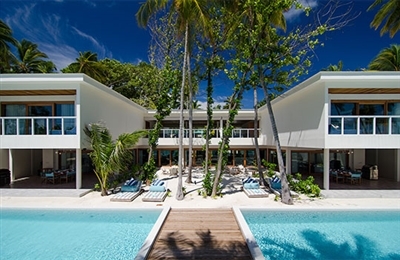 The sheer size and sensitive layout of The Great Beach Villa Residence makes it well suited for a large gathering of friends. It’s also very family-friendly, and within the villa there’s masses to keep kids entertained beyond the beach and pools – not to mention the resort’s extensive recreational facilities and kids club. It’s easy to lose all sense of time. In fact, ‘island time’ really does exist here, as the Amilla visionaries set their clocks two hours ahead of Male so guests can enjoy extra hours of daylight; how’s that for above-and-beyond service? A sign at the Empire Beach Club claims “Happiness is not a destination, it’s a way of life”. What a perfect epithet for our stay!